Norwich enjoys a rich history dating back to Medieval times, but what of its present day activities? Boxpod explores the commercial property market in Norwich. Norwich is the county town of Norfolk (aka Nelson’s County thanks to its famous son, the Battle of Trafalgar’s hero, Admiral Lord Horatio Nelson). Improving transport links and people’s desire to balance the quality of homelife v worklife has meant the regions are enjoying a resurgence in popularity with employers and employees alike. Norwich is about 100 miles from London and it is one of the cities where businesses can enjoy the best of both worlds. 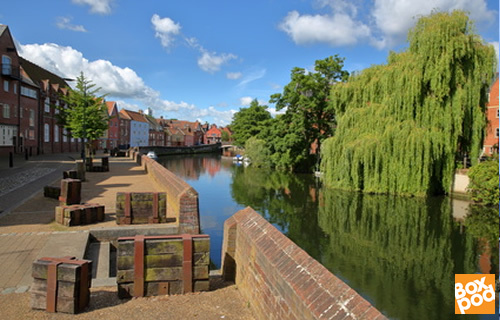 Norwich blends its historic culture with contemporary life and boasts the accolade that it is the only city in a National Park, the Norfolk Broads. High street names and independent stores and businesses can find a quality home in Norwich. It’s had its chequered past and turbulent times but businesses in Norwich are as likely to flourish as elsewhere in the UK with growing support and networking opportunities for entrepreneurs, start-ups and SMEs. Everyone starts somewhere. As Boxpod continues to grow from its Leicester roots so other fledgling firms can do the same. Looking at our data, over the last 12 months we have seen a sharp increase in business premises in Norwich being listed on Boxpod – up sixfold over the previous year. During the same period Boxpod advertisers in Norwich have seen enquiries jump by over 250%. “This helps to underline that Norwich is a vibrant and developing area with businesses keen to set up shop there,” says Boxpod MD Nick Marlow. Within the diverse mix of new and old buildings, there is scope for flexible and affordable commercial property to rent and buy in Norwich. Nick believes focussing on the regions is key to the success for many new and emerging young businesses. Remove the premium London weighting from your budget forecasts and see what’s on offer outside the Capital – there are prime premises and employees in the regions, often at a fraction of the cost. Mobile communications and technology really are opening up areas all over the UK for businesses. There are serviced office units to rent in Rouen Road, NR1 ranging from 1402-5690 sq ft, check for prices and availability. Marble Acquisitions has 1725-2665 sq ft industrial units/ workshops to rent in NR6. Find out of city storage units to rent with Grange Property Services at Attleborough, NR17 There is a site of 20ft metal containers on a secure site with daily access available.